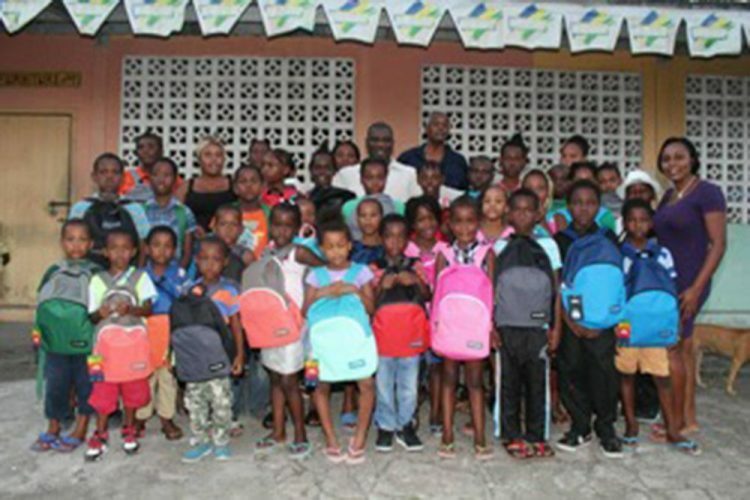 Over 200 students from the constituency of South Central Windward were the recipients of book bags and school supplies for the new school year, which commenced on Monday, September 4. This initiative was the brainchild of the New Democratic Partyâs (NDP) candidate for that constituency, lawyer Israel Bruce. from the children of Greiggs. According to Bruce, this yearâs programme was small and could not reach as many children as the division really wished. âWe were disheartened that we could not have assisted more children, as SVG is facing harsh economic times. Nevertheless, my heart was warmed by those who said that this little help went a long way for them,â Bruce said. He was clear that while the programme was being delivered from a political partyâs platform, the initiative was intended to assist those in need and not purely those who support his party. Children attending primary schools, secondary schools, pre-schools and colleges benefitted from the programme. Already plans are afoot for the 2018 programme, which the NDP South Central Windward Constituency Division Executive said should reach no fewer than 1,000 students who are in need of such assistance. It was a programme of all the colours, as depicted in the backpacks distributed. âWe took the moral high ground in this programme; we could have had printed on every bag the slogan âWe cutting loose with BRUCEâ, but we did not; alternatively and most fittingly, we could have had the coined and focused message âEducation is the KEY to success,â but we did not. We believe in and we reiterate the message of our party president Dr Godwin Friday, âOne Nation. One People. One Vincyâ,â Bruce said. âI want to use this opportunity to thank all those who helped in financing this 2017 project and seek your further assistance in 2018,â said Bruce, who is leading the charge for the opposition New Democratic Party in SCW. According to a release, the students were elated as they received their supplies and the parents also commended Bruce for his effort and expressed their gratitude to him. Many stated that he had eased their financial burden as they prepared for the new school year. According to Bruce, the back to school assistance programme will be an annual event.